Canada and Israel are both built on land and resources stolen by European settlers; both are still sustained by the ongoing repression of indigenous peoples. The indigenous peoples of Canada and Palestine are on the front lines resisting the destruction of the land by militarism and industrial extraction. In the mainstream media and the halls of power, indigenous activists’ voices and stories have been silenced – they are treated as terrorists or historical curiosities. 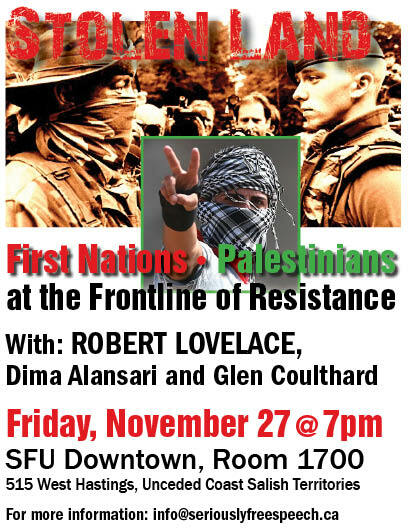 This evening will explore the commonalities of indigenous struggles for land and freedom in Canada and in Palestine as well as connections to the global fight for a decolonized world. ROBERT LOVELACE is a lecturer at Queen’s University’s Dept. of Global Development Studies. An activist in anti-colonial struggles, he spent 3 ½ months in jail as a political prisoner for defending the Ardoch homeland from uranium exploration. A former chief of the Anoch Algonquin First Nation, Robert sailed twice on the Freedom Flotilla attempting to break the blockade of Gaza. DIMA ALANSARI is a Palestinian-Kuwaiti filmmaker and performer based in Vancouver. She co-wrote and performed in “Return Home,” a play about the intersecting journeys of an Anishinaabe woman from Quebec living under the legacy of colonization, and a Palestinian woman born in exile, living in diaspora. She is currently the creative director of Salish Sea Productions, a media and production collective creating socially relevant works on themes of social justice, Immigrant, Indigenous and intercultural issues, women, youth & environment. GLEN COULTHARD (Yellowknives Dene) is an assistant professor in the First Nations Studies Program and Political Science Department at UBC. His recent book “Red Skin, White Masks” exposes the politics of Canada’s ongoing colonialism. Endorsed by Boycott Israeli Apartheid Campaign, North West Indigenous Council, Streams of Justice, United Network for a Just Peace in Palestine and Israel. This entry was posted in SFSC and tagged SFSC Event. Bookmark the permalink.